Step 1. Grab a packet of Tim Tams and the cream cheese. Step 2. Place them in a food processor and blend until well combined. Step 3. Roll tablespoon-sized balls of the mixture and lay on a tray covered with baking paper. Place in the freezer for 30 minutes. Remove from the freezer and push lollipop sticks into the balls. Step 4. In a heatproof bowl, melt the chocolate and dip the balls into the melted chocolate. Tap on the side of the bowl to remove excess chocolate. Lie onto baking paper and decorate. I used ready-made fondant decorations from the supermarket but you could also use desiccated coconut, 100s & 1000s, crushed nuts, sprinkles or melted white chocolate. 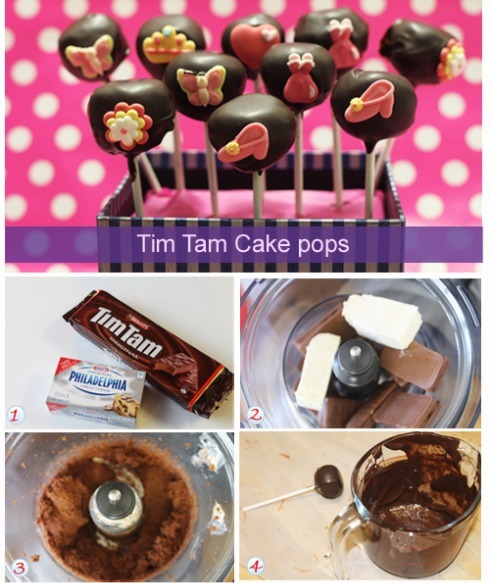 You can also use Mint Slice biscuits in place of Tim Tams for this recipe. This recipe makes 10 cake pops and may easily be doubled or even tripled. These are great to wrap and give as gifts. If you want to display these on a party table, you can place some florist’s foam (Oasis) in a gift box and cover it with tissue paper. Then you can just poke in the pop sticks and serve.